Sika T54 13KG elastic adhesive designed for a full surface bond to concrete and timber subfloors. Sikabond T54 is a single component floor adhesive that is suitable for installing hardwood flooring with a permanent full surface bond. 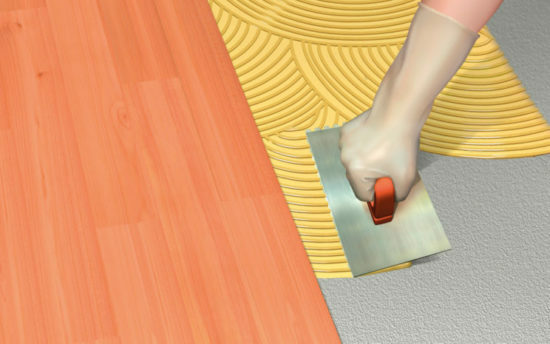 Sika T54 is an elastic adhesive that is trowelled on and bonds the wood floor directly to the subfloor. Unlike rigid glues it allows the wooden floor to naturally expand and contract with climatic changes and consequential increase & decreases in moisture conditions. It is not simply a flexible glue, it is an elastic adhesive with great shear strength which means that it can spring back to its original position without breaking. Yet its bond to the floorboard and subfloor is ‘pry bar’ strength IE it requires a pry or crow bar and significant force to separate them. Sikabond T54 has been the leading product favoured by professional floor fitters for many years. Sometimes incorrectly called Sikaflex, Silka, its now been improved with i-Cure technology and renamed as Sikabond 54 woodfloor. However its still commonly still referred to as Sika T54. Sika T55 is an old school solvent based adhesive product which is now discontinued by Sika UK. Use Sika 54 woodfloor for almost all applications now and for parquet flooring & gluing to bitumen based subfloors use Sikabond 5500s. As a Sika distributor, Oakwoods supplies direct from stock across the whole of the UK. Cheapest prices, free gifts and next day delivery with 3pm cut off time. There are other adhesive suppliers but Sika UK have an enviable reputation for manufacturing best of breed products and this full surface bonding technique is recommended for all Oakwoods floors..
Sikabond 54 wood floor provides a comfortable yet solid feel underfoot with very little noise and no hollow or 'tip-tap' sounds. This is because footfall sound is transferred downwards into the subfloor and is perfect for concrete and ground floor installations. T54 is designed to glue to timber and concrete so there is no need to batten out a subfloor as the floorboards can be bonded directly to the concrete subfloor and to work with underfloor heating. 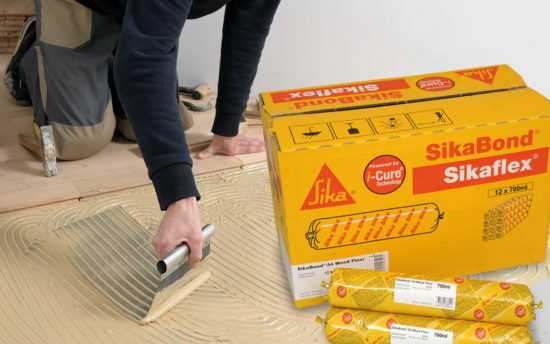 Sika 54 is the product of choice for wet underfloor heating systems embedded in concrete as it allows for an even transfer of heat from the concrete through the adhesive layer to the top surface of the hardwood floor. The nature of the full surface bond means that there is no insulating underlay to slow down the heat transfer and no hollow areas of trapped air to heat up. This results in an even transfer of heat to the surface without hot spots underfoot. 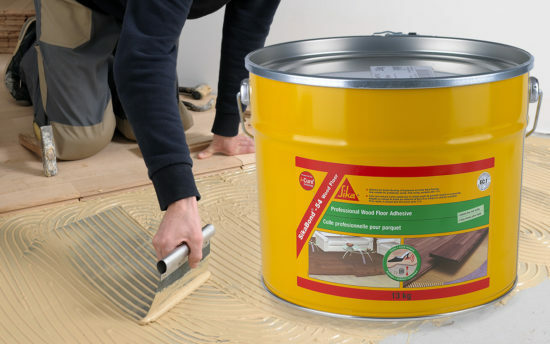 Sika T54 floor adhesives can be used to bond both solid and engineered wood floors including strip flooring, planks, boards, mosaic panels, parquet blocks. It can even bond maple, beach, bamboo and of course Oak flooring in solid wood floors up to 200mm wide, engineered of 350mm wide and unrestricted length. It can even be used to glue plywood, orientated strand board (OSB) and chipboard. A note of caution on the OSB and chipboard – Sika glues will happily bond to the surface of these boards but there will be a risk of failure within the boards themselves because they are made up of small glued together timber particles. Always ensure that the subfloor is level – if in doubt get a professional floor fitter to check it. Sub floors that aren’t level or have hollow low spots and high spots will result in expensive glue consumption. Try to work cleanly with the adhesive to avoid getting glue on the top surface of the board – If possible have one fitter fitting and one trowelling out. Wipe clean tools and pre-finished floors with Sika-Everbuild wipes straight away. Always check the moisture level of a concrete screed. It should ideally be 0% but up to 1% or 2% depending on installation factors and screed type – Please see Sika T54 Product Data Sheet. Typically a 3 inch concrete screed takes 3 months to dry or one day per millimetre of screed. Often using Sika Rapid DPM or Sika MB Primer can reduce the time by half, so long as the moisture content in the screed is reduced to below 5%. Use a Tramex Concrete Encounter (CE) to test the moisture level in the concrete screed. Please see Sikabond T54 Product Data Sheet. Use a B3 trowel or B10 trowel for belt and braces approach and for wider and longer boards. Sika Everbuild no longer supply these so please purchase a B3 trowel or use the B10 trowel provided free of charge by with qualifying orders. Never prime the subfloor with PVA glue or similar primers. The Sika glues need to bond direct to the concrete not a PVA surface film. Consider using Sika Rapid DMP or Sika Primer MB for peace of mind protection of the wood flooring and to increase the coverage rate of the T54. T54 is moisture curing and can skin over within 60 minutes. Always replace the lid between applications and try to use a complete tin in one day. Otherwise it will skin over in the tin but the skin can be carefully cut away and the waste adhesive discarded. To install over a longer period of time at a slower rate use T54FC 700cc sausages – each one does approx. 1m2. Always carefully press each floorboard firmly into the adhesive to ensure that the underside of the plank is fully covered. Old sub floors with residues still remaining should be mechanically cleaned to expose 80% to 90% of the concrete. Use Sika MB Primer to coat it before bonding with Sika adhesive. This applies also to residual Bitumen coatings on the sub floor or reclaimed parquet blocks – If in doubt contact us or Sika Technical for guidance.